I was looking back over the earlier posts and thinking of how much fun I had making all these bags for you. And also how long ago it seemed. Like years. And then I checked the dates and - whoa! Do you guys even remember this series? My grand plan was to introduce a new concept or technique in each chapter, and make a bag to demonstrate it in action. Now we've only got 3 more chapters to go. That's 3 remaining bags to deconstruct. These last 3, though, are horribly ambitious. Either their construction is more advanced than you might be used to, or else they combine many different features which could distract from the point of making them, which was to demonstrate a single, particular technique. So . . . you know that concept sequence I was just talking about? It seems that somewhere along the way, all those single concepts overlapped and became enmeshed. And these last 3 bags are the result. I'm going to deconstruct them anyway, with the reassurance that if you get lost the second we plunge in, it's not your fault. In their entirety, these are difficult bags. I'm not even going to say "challenging"; "overwhelming" might be a more accurate descriptor. However, if you can isolate different parts of these bags and say, "I'm going to focus on only the strap" or "I think the front pleat is what I'm taking away from this" or "I'll just learn how to do that zippered slit", you'll be okay. In other words, try to think of these next 3 bags as a smorgasbord, not a single meal, okay? Today's bag is a backpack. 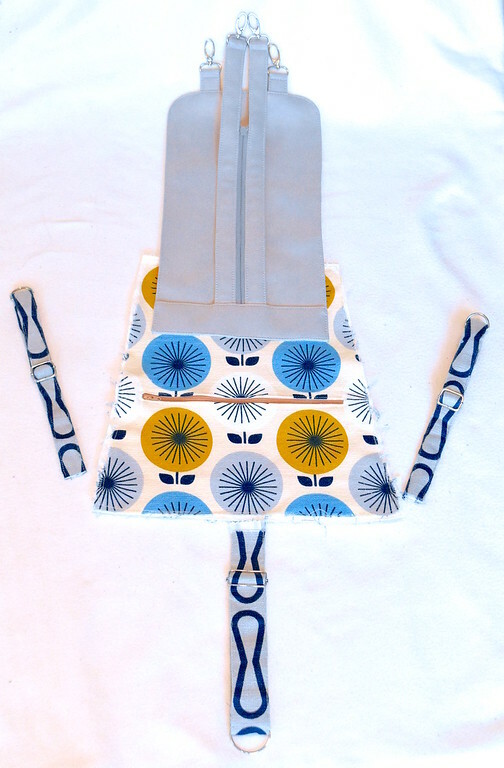 A long time ago, when I was in my early twenties, I made a bag like this for a friend who was (and still is) a drummer. Rather than the classic drumstick cases available at the time, which were flat hanging pouches that snap-hooked onto the drum rims, she wanted a sturdy base, plus inner pockets to organize her sticks, and which could sit on the floor by her feet and somehow open up for easy access to switch sticks and brushes around while playing. 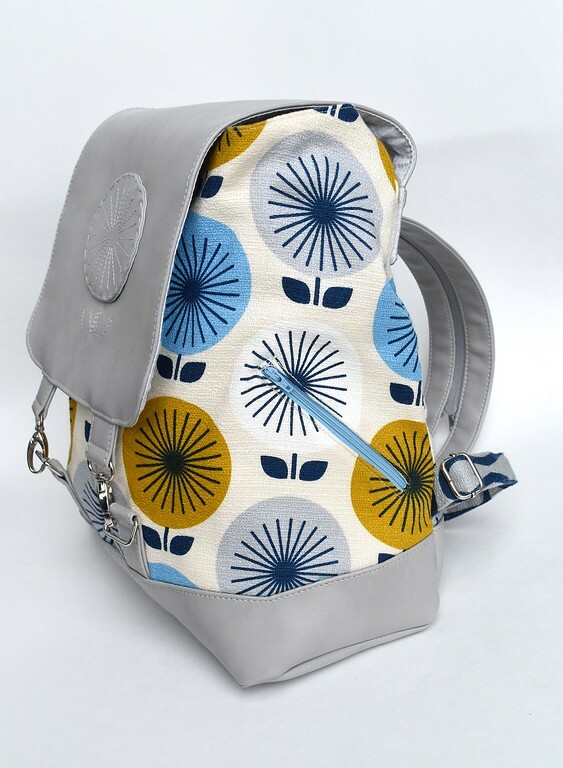 And because she'd also be carting around cymbals and whatnot, she wanted a shoulder bag, although a hands-free backpack would've been "even better". And it couldn't be floppy. And it had to look cool because, you know, drummers are cool. Those were a lot of descriptors for something that has no photo to help you visualize it. Sorry. 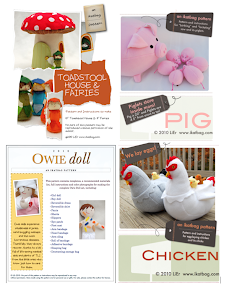 I wanted to include that to illustrate that when you are in the business of customizing (clothes, toys, bags, etc.) you sometimes get asked to make something really fun that stretches you, and sometimes people ask not for what they want a product to look like, but what it can do, and they may not know the correct industry words to use. Therefore, the more techniques you know, and the more you understand bag-making principles, the better armed you are to translate a fuzzy, idealized request into a concrete finished product. And sometimes, having piecemeal techniques under our belts is only the first step - we also need to know how to sequence their construction within the assembly process. 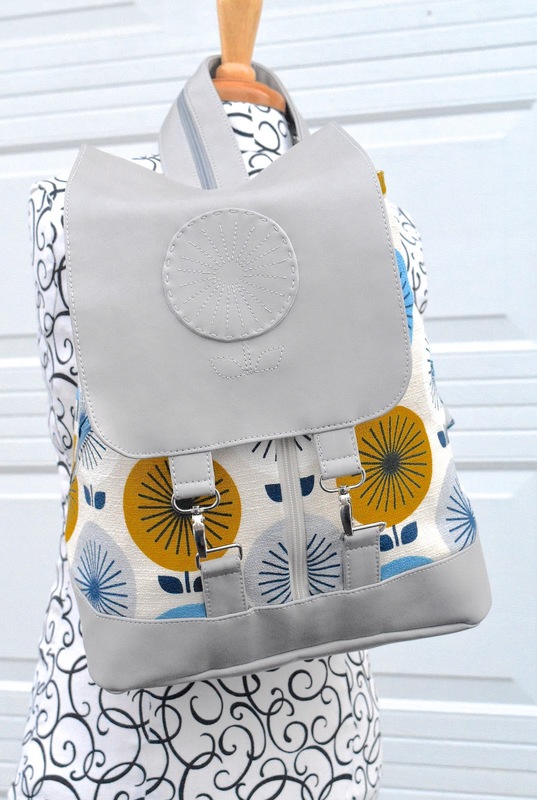 So yes, I did make that bag for my friend, and today's backpack is a tribute to it. It has many of the features of that original drumbag, except it is in much cooler fabric. For the sake of this tutorial series, I simplified some bits and made other bits fussier. Let's walk through those features! First, it has a front flap, which partially covers a central front zipper (more on that later). 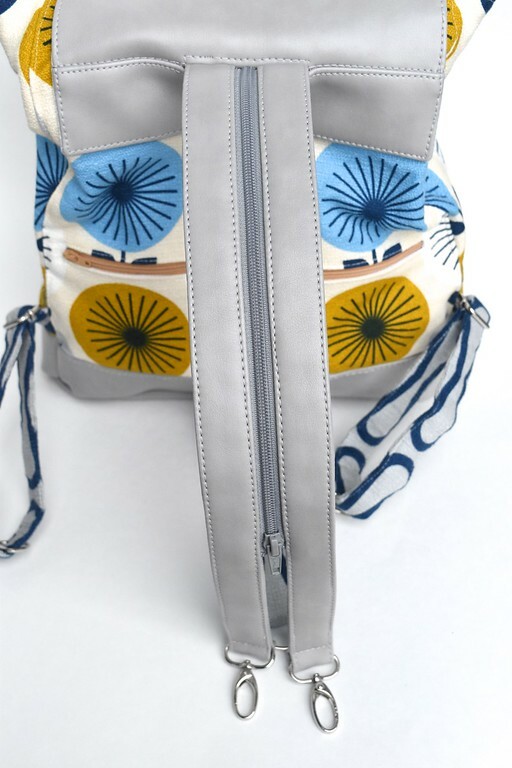 Because of the central zipper, the front flap has two side clasps instead of a more traditional single central one. The other end of the flap attaches to the back of the bag under a rectangular panel. 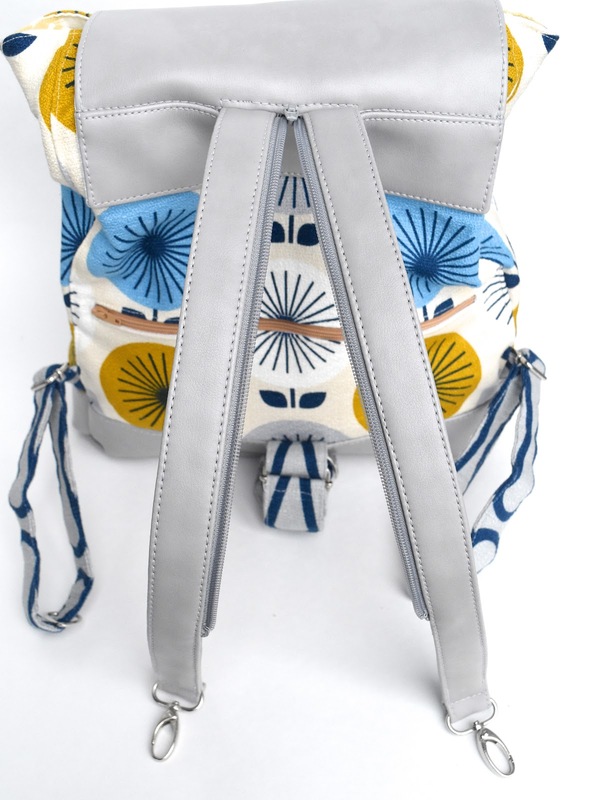 The carrying strap of the bag attaches to this back panel. 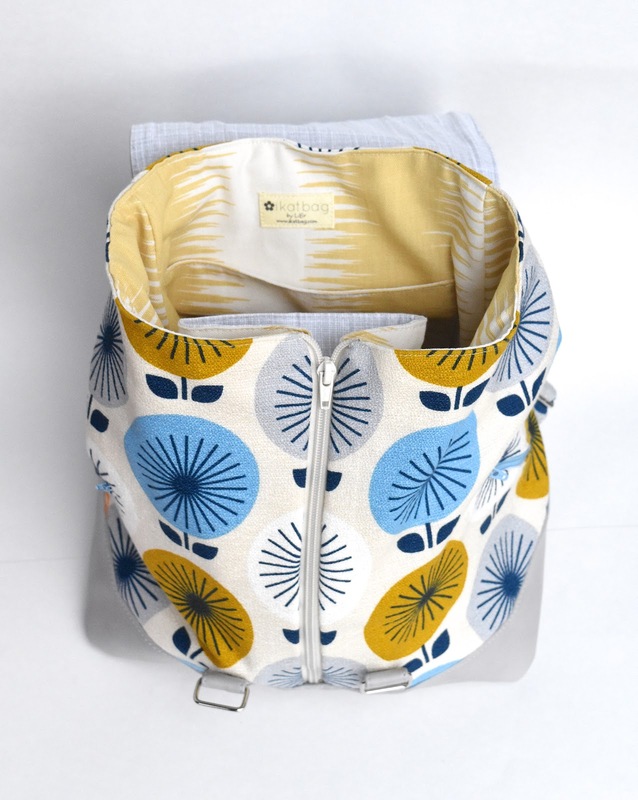 On the back of the bag is a zippered pocket, and three adjustable strap anchors. In my friend's old drumbag, these anchors were short, simple fixed-length tabs because there was no need for an adjustable length - the bag was custom-made for her body. 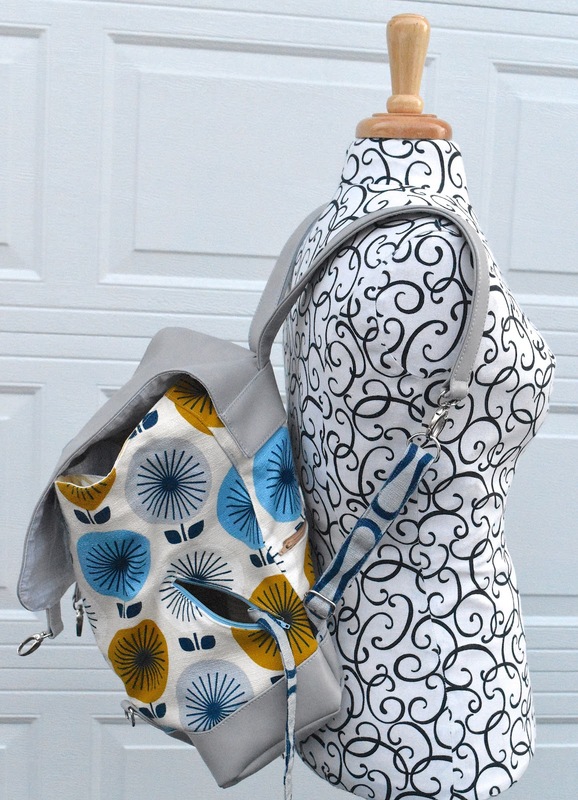 In this backpack, I made the anchors adjustable because I don't know who it will eventually belong to! 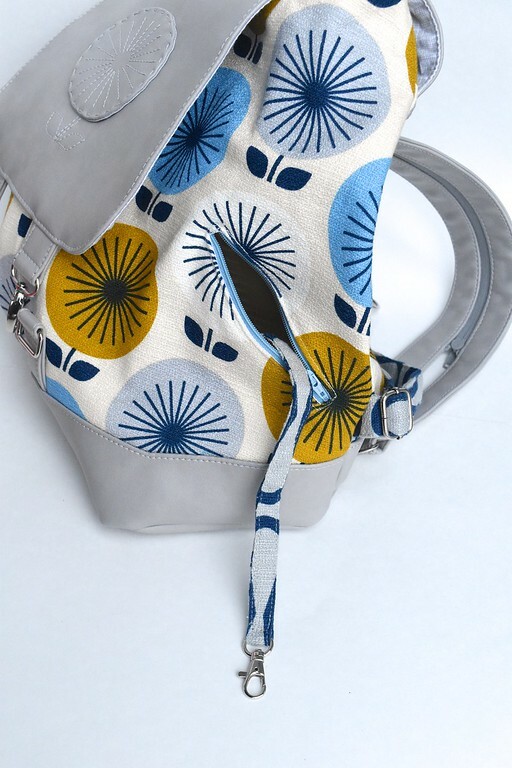 which, depending on whether it is zipped or unzipped, toggles the bag between shoulder bag and backpack. 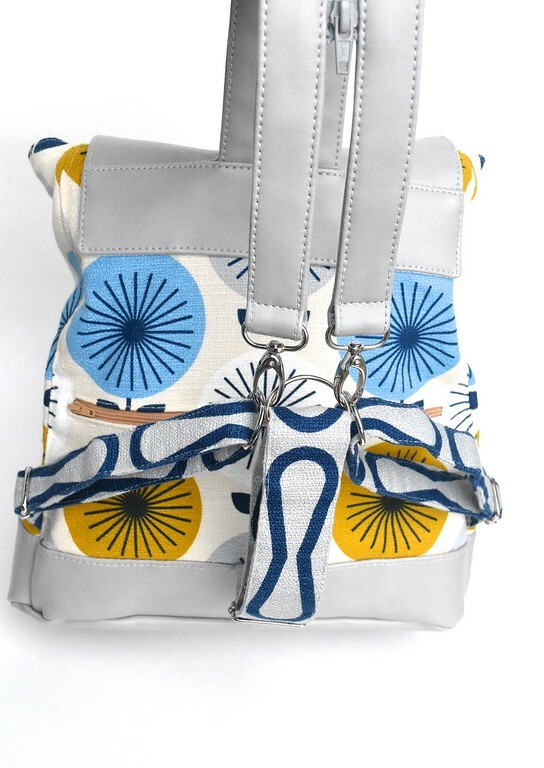 In shoulder-bag mode, the strap is left zipped closed and the two hooks fastened to all three strap anchors (or the central one and either side, depending on whether it is worn left-cross-body or right-cross-body). 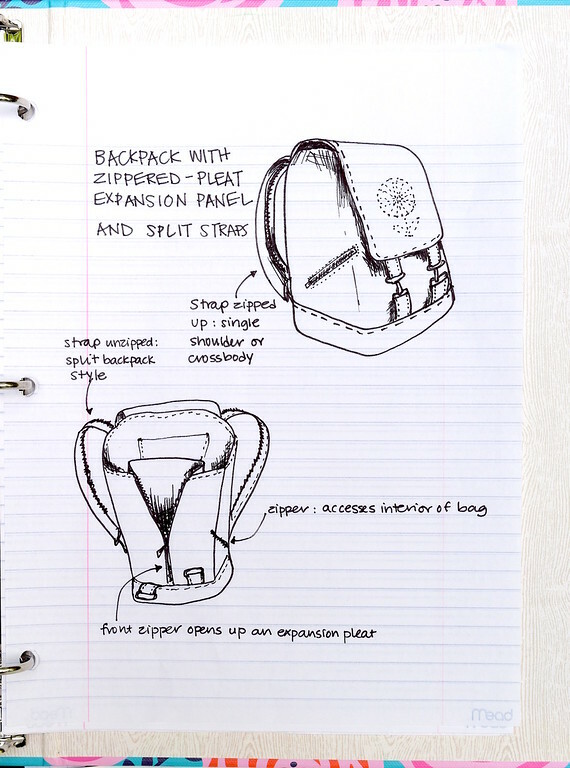 In backpack mode, the strap is unzipped and each of those split straps hooks onto a side anchor (which adjusts the strap length). Because the central strap anchor now hangs loose in this configuration, it's looped through either of the side anchors to keep it from dangling. behind which is a pleat. There is also an inner pocket on the back wall. so you can pack and unpack larger items e.g. ring binders. 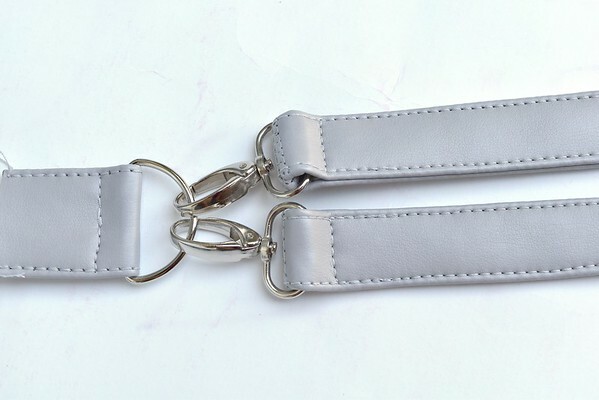 There's also a key strap, because I like being able to easily pull my keys out of a bag without fishing around forever. 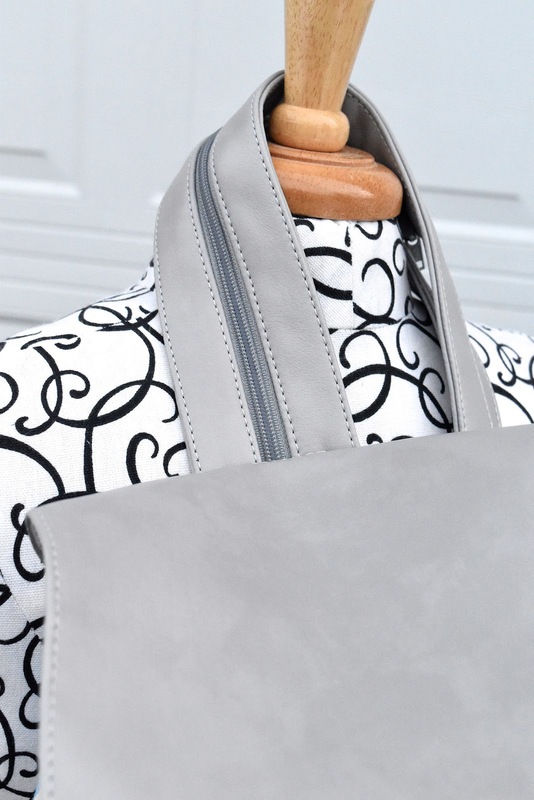 The front pieces of the bag wrap around each side and join the back piece in a seam. The side strap anchors are inserted into that seam. Also on each side is a little zipper. 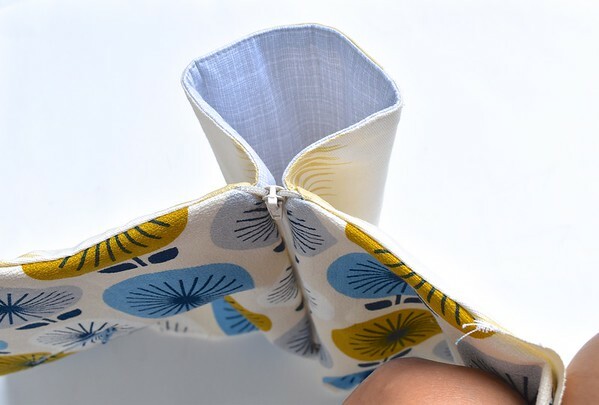 One opens to a small side pocket for things like spare change or earbuds. so you can shove your hand in and directly access the contents. Very useful if, like me, you like fishing out your keys while your bag is still on your shoulders. and a lot of topstitching. there are lots to pick and choose from as far as new things to learn. 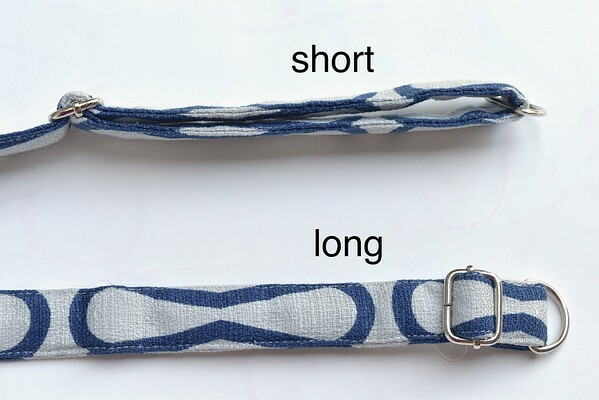 This is the tutorial for a truly reversible strap, which is what the carrying strap is, sort of. However, because it has hardware only on ONE end, I left the other end free, so the strap fabric piece is a long strip instead of a closed loop. 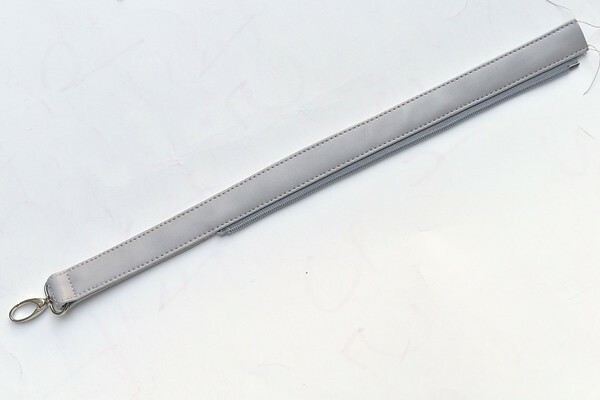 two strips (18"+SA) long and join one end of each to the other. Here are some RS/WS views of that joint. 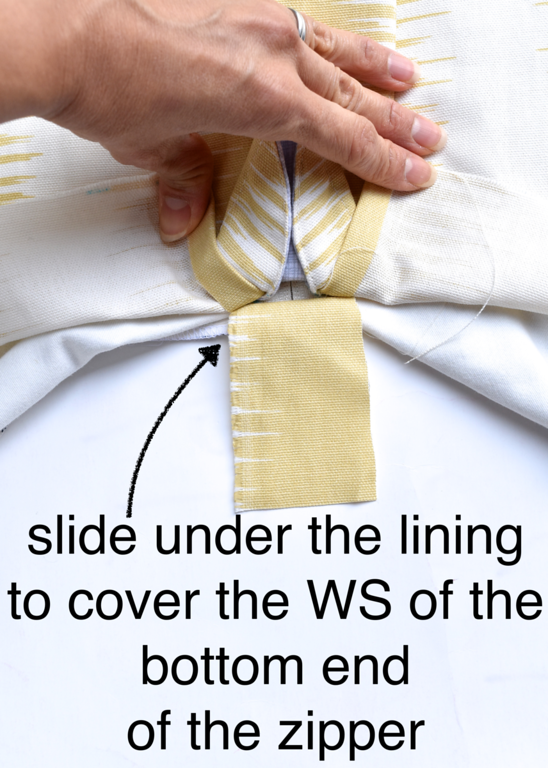 As in the tutorial, fold the edge SA to the WS in that joint section and edge-stitch. This is where the hardware will rest. Slide the hardware (snap hook, in our case) onto the strap. 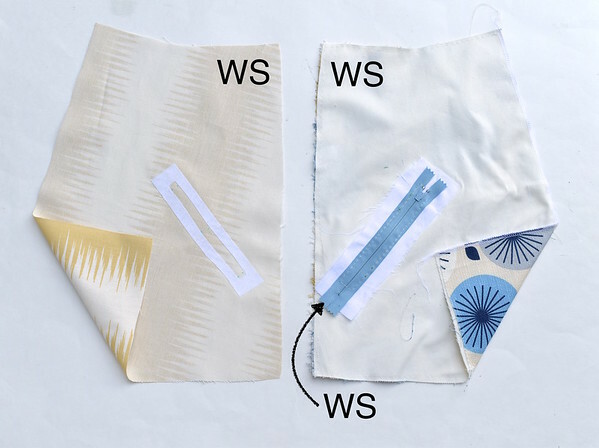 In a regular reversible strap, you'd just fold the fabric strip at that joint so the WS are together, and fold the SA to the WS and edge-stitch through all layers along both long edges. That linked tutorial demonstrates this. Here, however, we want to add a zipper. You can use a regular non-separating zipper, but we used a separating one so we could work with one side at a time. Our zipper is a little shorter than the finished strap. Lay the zipper RS up on the RS of one half of the strap. 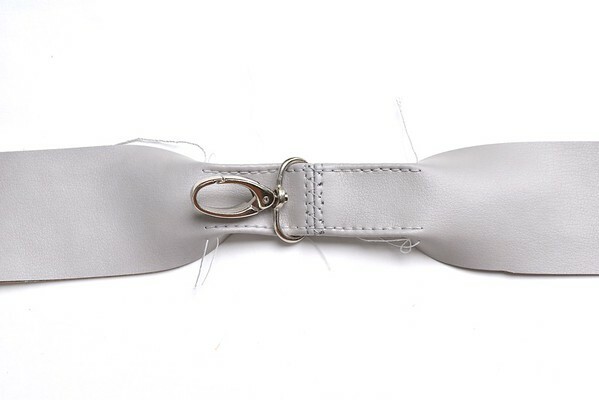 Make its tail end flush with one strap end - this is what will be inserted into the bag flap. Fold over the other half of the strap so their RS are together and sew along one edge to secure the zipper tape between the layers. Note the tiny bit of the head end folded into the SA region. Below, again, are RS/WS views. Turn everything RS out, twisting the hardware end RS out accordingly. See the zipper coils peeking out? Also see how the head end of the zipper disappears into the SA? 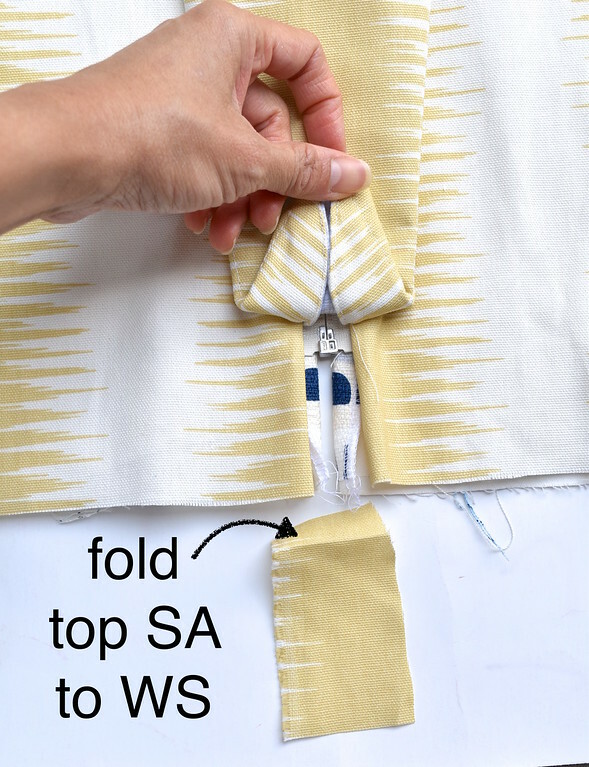 Now fold the SA of the other long edge to the WS, sandwiching them between the layers, and edge-stitch a 3-sided rectangle to secure. Stitch as close to the hardware at the end as you can. This is one finished half-zipper strap. Repeat to make the other half-zipper strap. Remember to attach the zipper tape to the correct edge so the two halves of the zipper tape face each other! 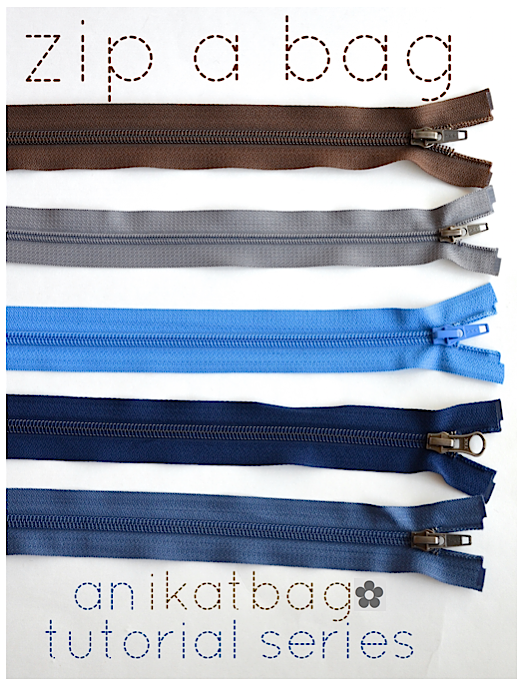 which, if you are not interested in adjustable lengths, is exactly all you need - you can move on to installing this strap system to your bag now. 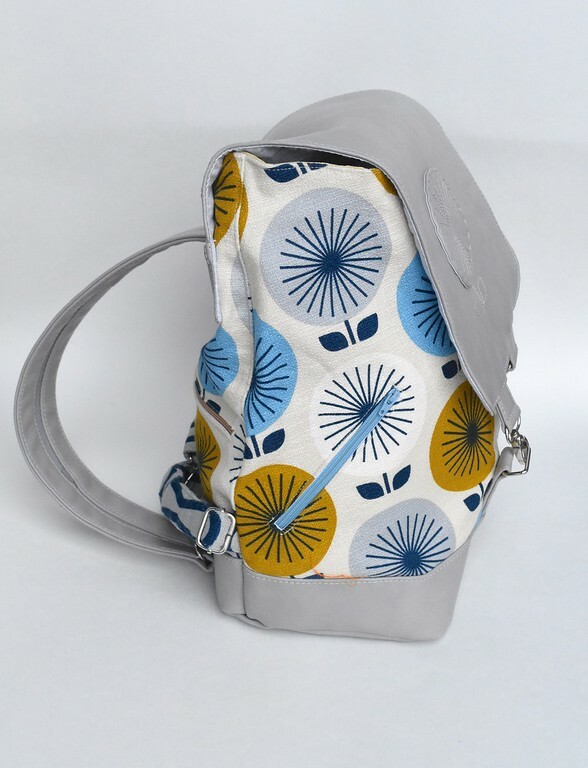 BUT if you want your strap system to have an adjustable length so not only you can use this bag, but also your daughter, your best friend and random strangers of varying heights and body sizes, we'll need to make adjustable strap anchors. Here are our strap anchors. You can use webbing to save time, but I made mine from fabric. I left the ends uneven so you can see the layers of interfacing I used for soft fabric like this. 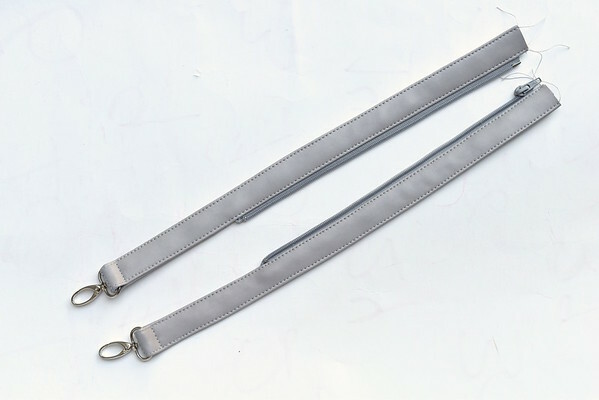 Here is a picture of the strap in its short and long positions. 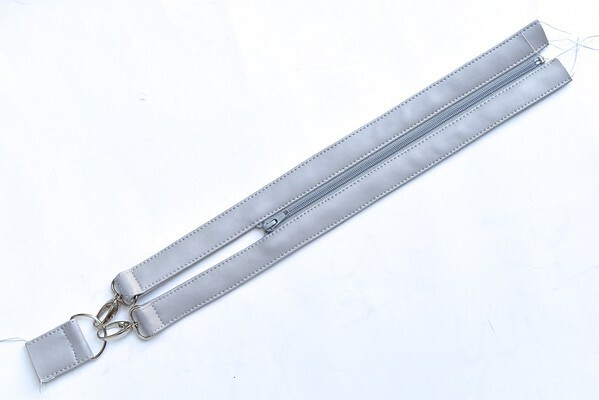 This is the zippered-convertible strap with its adjustable anchors. We're now going to attach them to the bag. 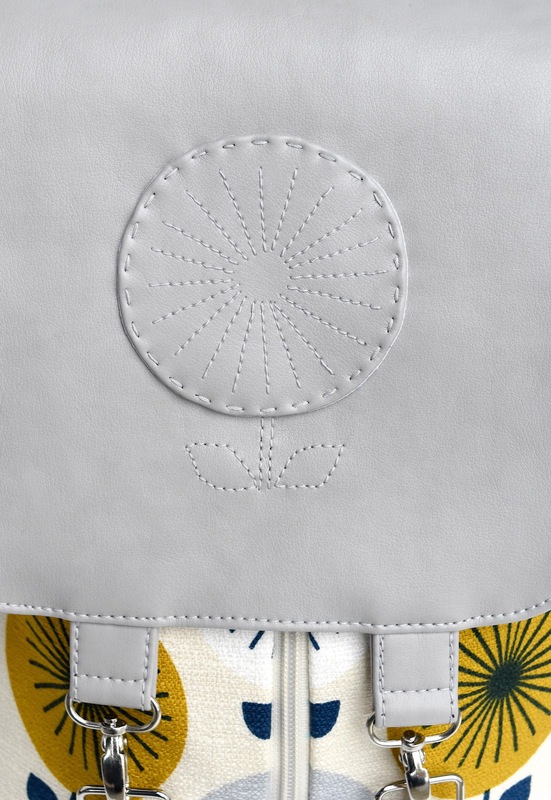 The zippered portion attaches to the flap. There are many ways to do this. 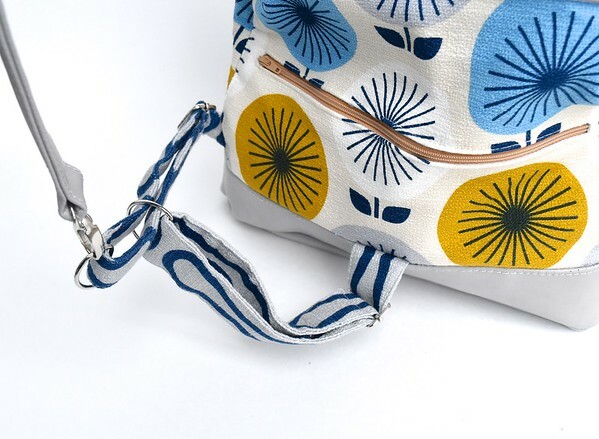 For this bag, the end of the strap without hardware is inserted into the seam between the flap and the rectangular back panel. 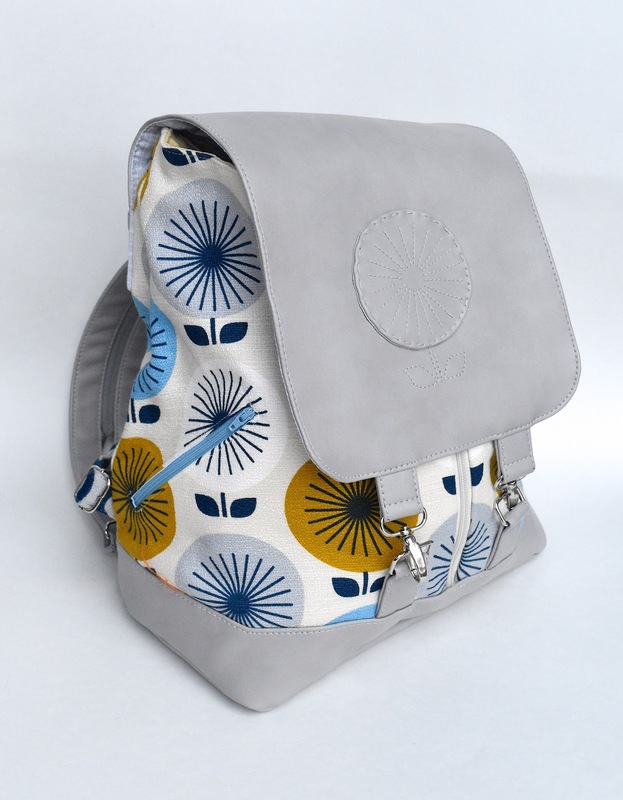 Then the whole flap-strap ensemble is sewn to the back body of the bag. 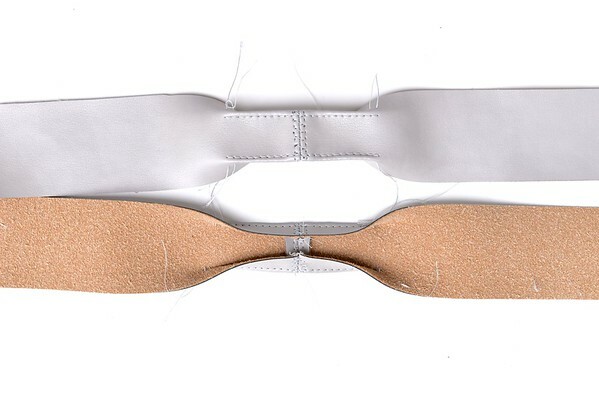 The skinnier side anchors attach to the sides of the back body for the split-strap configuration. 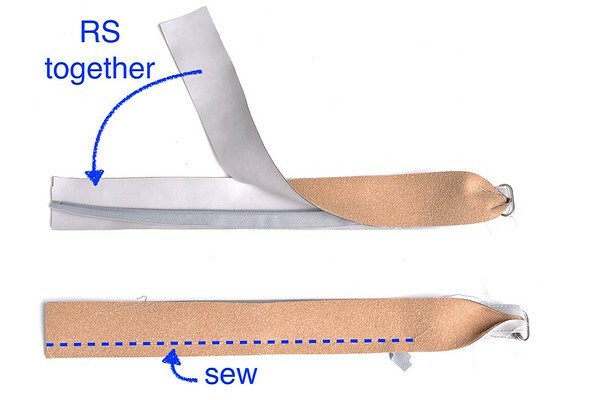 They are inserted into the side seam at an angle. There is also a wider central anchor to accommodate both snap hooks when the carrying strap is zipped up. That orange-browny zipper in the back body opens into a welt pocket. 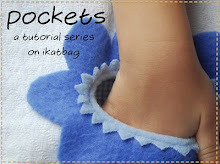 Go here for the tutorial to make this pocket. This is the same kind of pocket as the back one earlier. 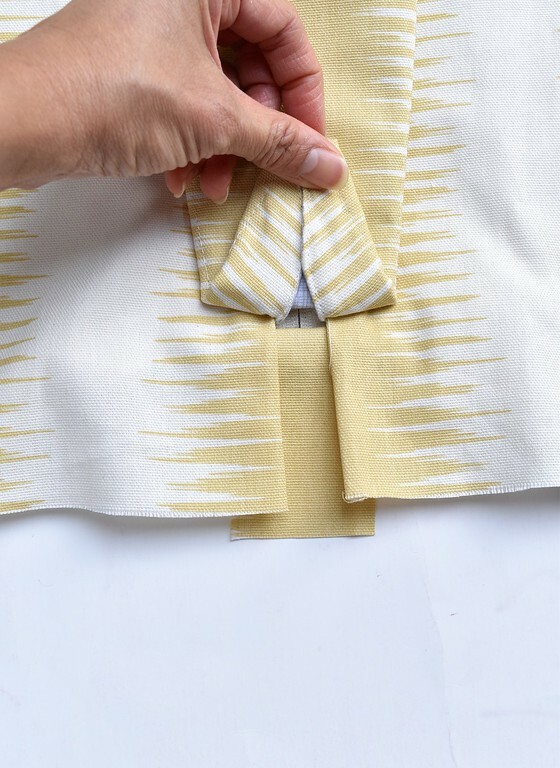 Welt pockets are especially useful when used with print fabric - we're cutting the welt opening as a window in the fabric itself, so there are no seams at which the print needs to be aligned (hurrah). 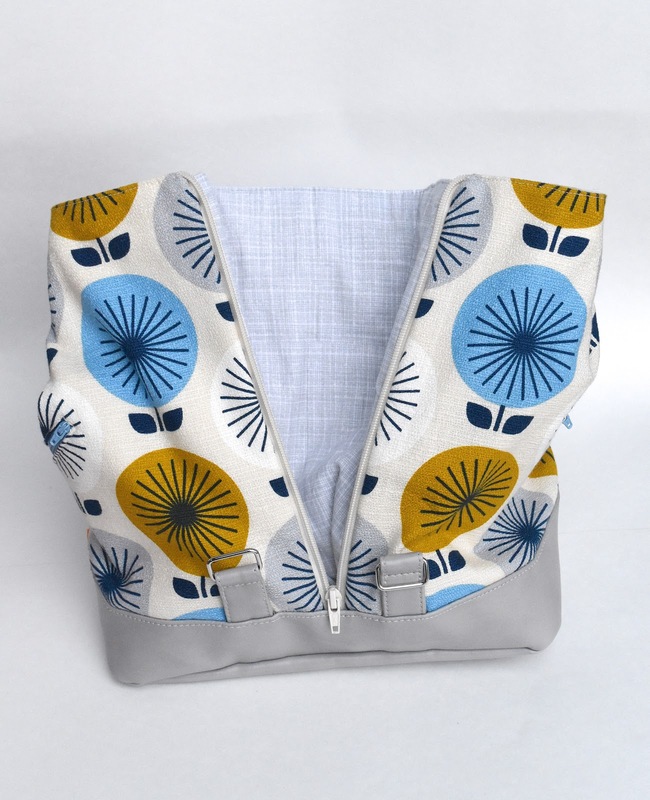 This zippered welt pocket will be fully constructed before this side panel is assembled together with the back and base of the bag. It is instead an access slit to the contents from the outside. Depending on how you're dealing with the main seams of the bag (both outer and lining layers), this little welt would be constructed early or very late in the bag-assembly sequence. 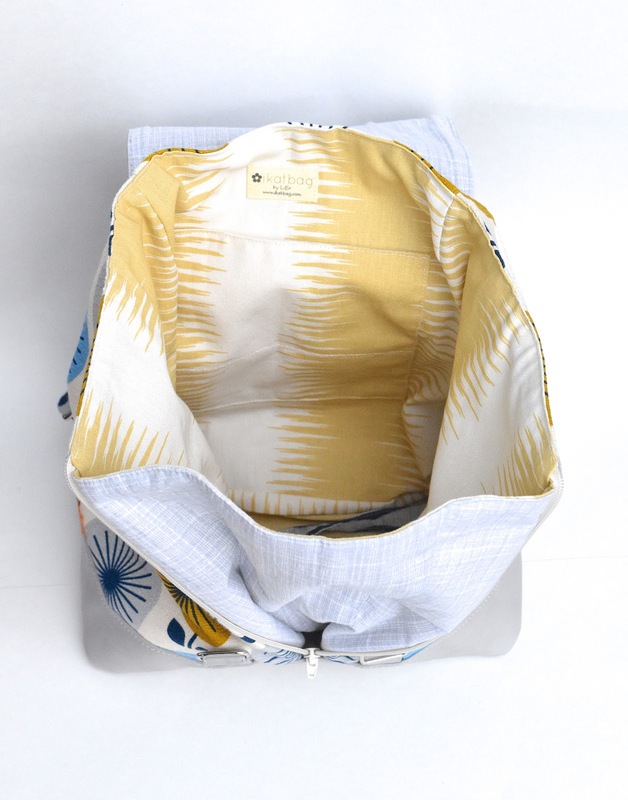 Many lined commercial bags are constructed with outer and lining as a single composite layer, and its main seams bound on the interior of the completed bag. In such cases, an access welt like this can be constructed early in the sequence and fixed in place within that composite layer. This bag, however, has separate lining and outer layers, and the access welt must be partially constructed early in the sequence when the layers are apart, and finished only in the very last stage when those layers are finally brought together. This is the overview photo to help you visualize what's needed. These are the two layers of the SAME SIDE of the bag. 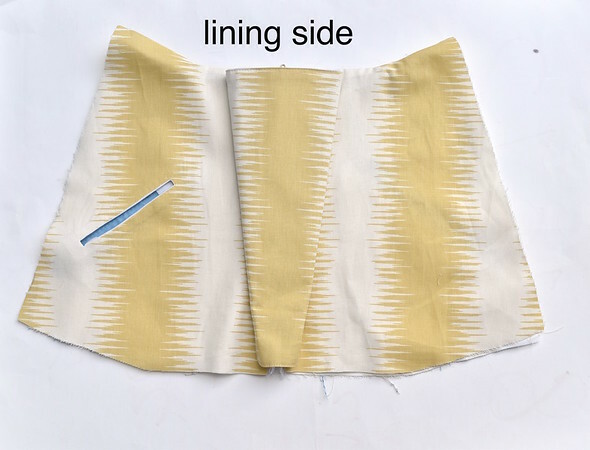 On the left is the lining. Because it isn't stabilized in its entirety, the welt requires interfacing fused around the opening. 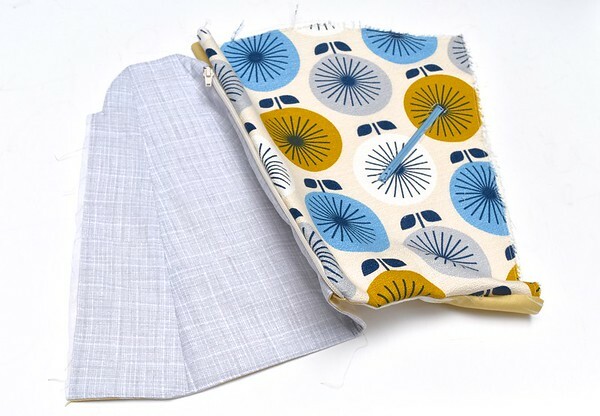 On the right is the outer fabric. It is stabilized with white cotton. The welt opening of the lining is mirrored in this outer piece, with facing (see next photo) and the zipper basted in place. Here is how we prepare the welt. 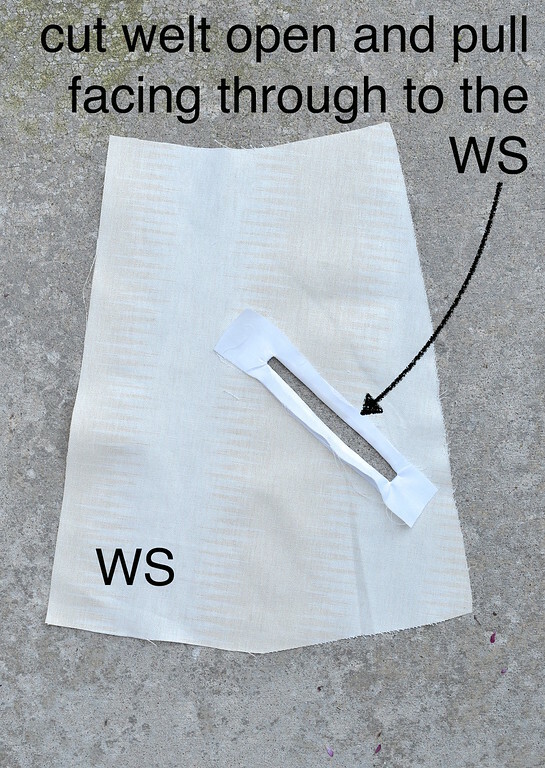 See this tutorial for more detailed instructions on making zippered welts in general. 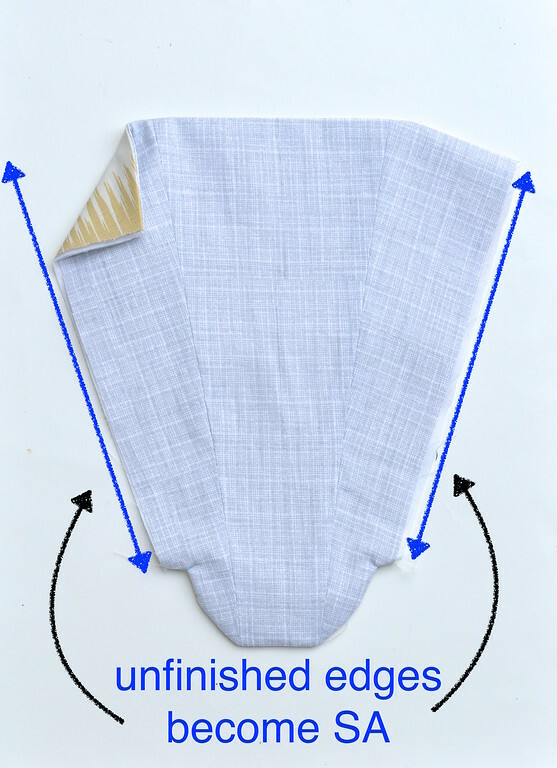 On the RS of the fabric, lay a rectangle of fabric roughly the size of the interfacing window you'd fused around the welt. 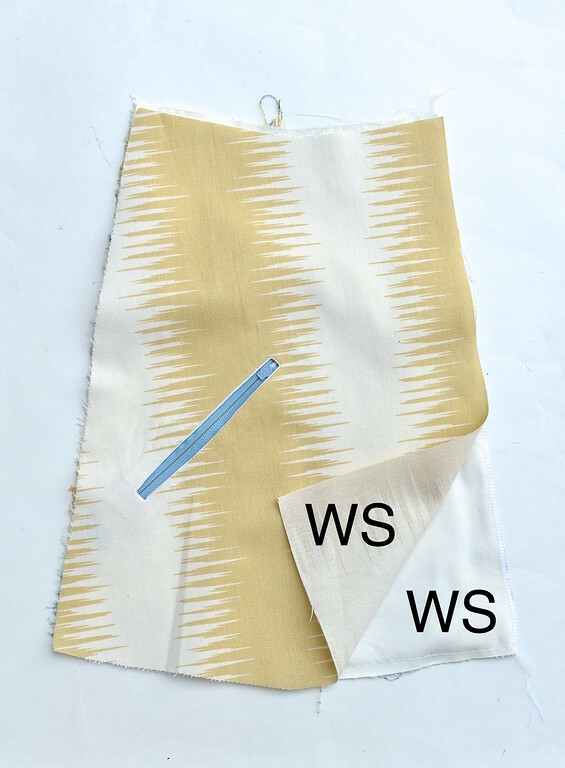 Stitch that in place along the welt, cut the welt open and pull the facing fabric through the welt to the WS as shown. Press down to get crisp lines around the opening. Repeat this to face the outer fabric's welt opening. Position the zipper coils within the opening as shown below, and BASTE in place (see green stitching lines). The final stitching line will be made at the VERY END of the aseembly process for the whole bag. on the outer layer: a faced welt with the zipper basted in place. These two layers will remain separate until the very end of the bag-assembly process. At that point, you will be placing the WS of these two layers together and stitching around that welt to hold the zipper in place between them. Conceptually, it is as easy as that! We will mention this final step at the end of this tutorial. This looks terrifyingly complicated, but it isn't. However, you need to be able to visualize how it works; having done so, you will see how simple it really is in concept. which will make sense only after turning everything RS out. The top edge is now finished, as is the pointy bottom edge. 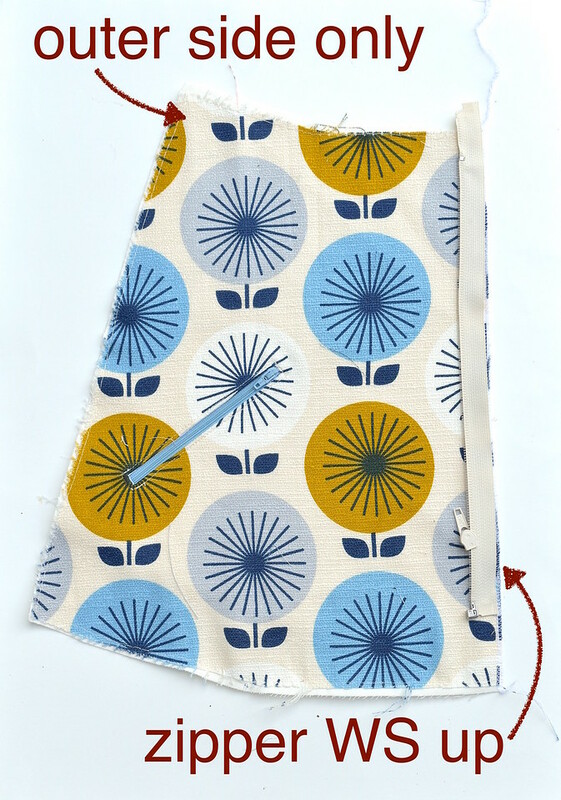 The open sides now become the seam allowances (SA) for attaching this panel to the zippered front opening of the bag. Those aforementioned corners turn out as tabs. Now let's take one of the outer fabric side pieces. 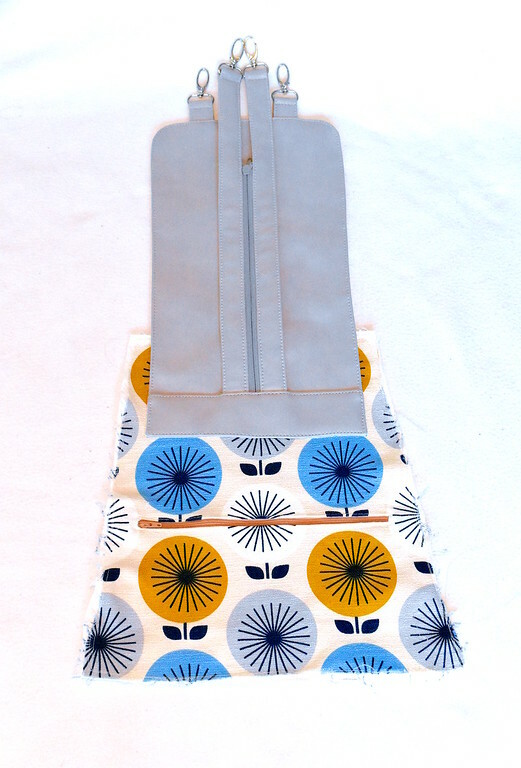 This one has the zippered welt POCKET, which is fully constructed. 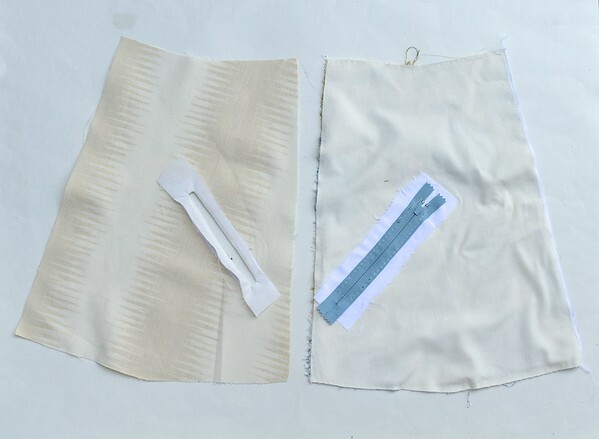 We are using a separating zipper for ease of demonstration in this tutorial. 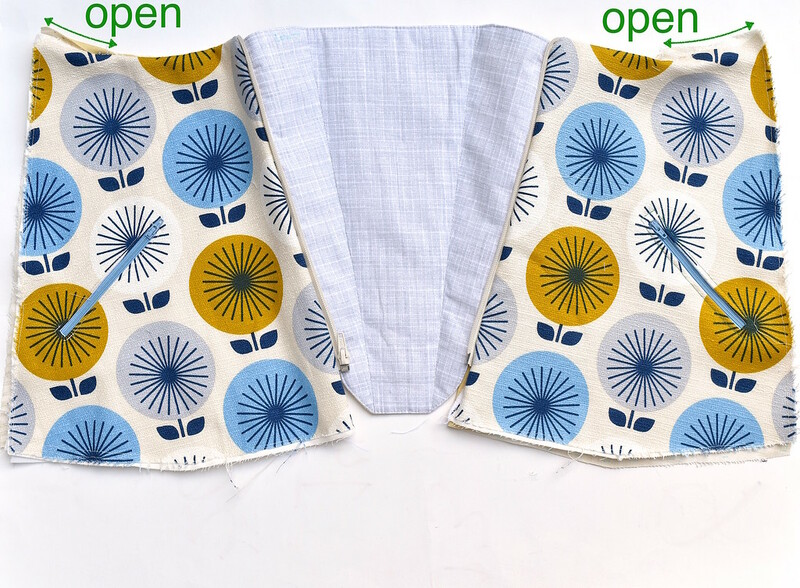 A non-separating zipper can also be used. 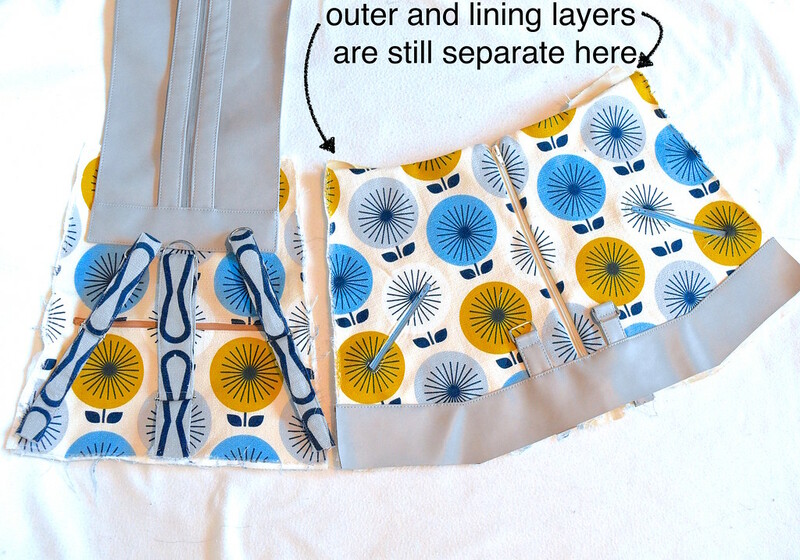 Lay one half of the zipper tape along the edge of the zippered opening, as shown. 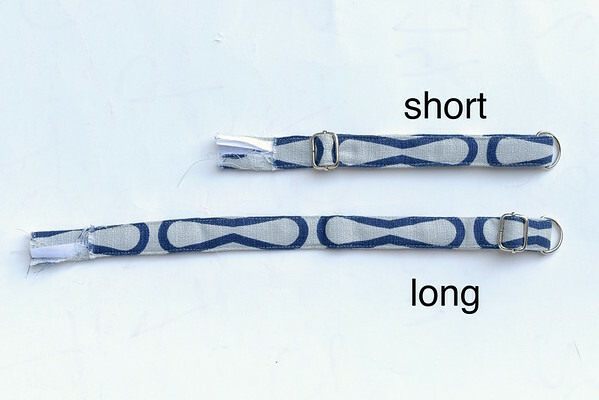 The RS of the zipper tape touches the RS of the outer fabric piece. 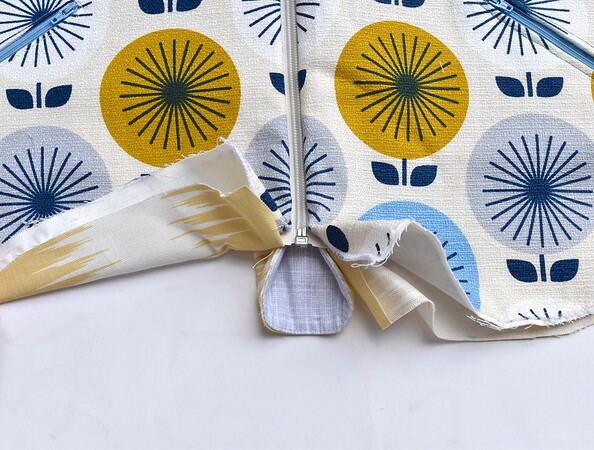 The tail end of the zipper stops above the bottom edge of the outer fabric piece - we will be layering a faced vinyl hem (border) on that lower edge later. 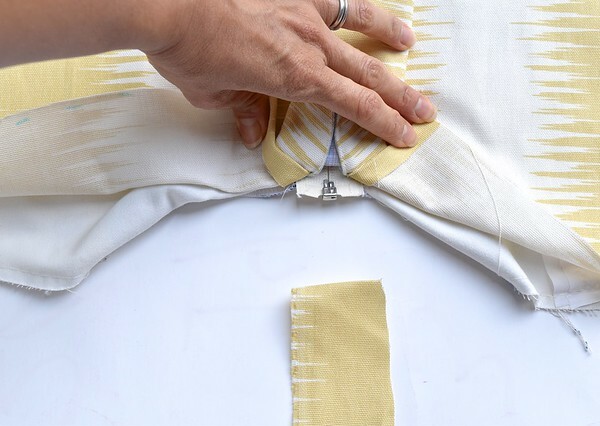 Now layer the pleat panel over the outer-fabric-and-zipper, with their RS together. Note the green X - this indicates the FINISHED upper edge of the bag, and the top (finished) edge of the pleat panel is aligned with it. Baste in place. Finally, layer the lining piece over everything, with its RS touching the pleat panel. Sew along the side, stopping where the zipper ends (explanation later) and partway along the top edge. 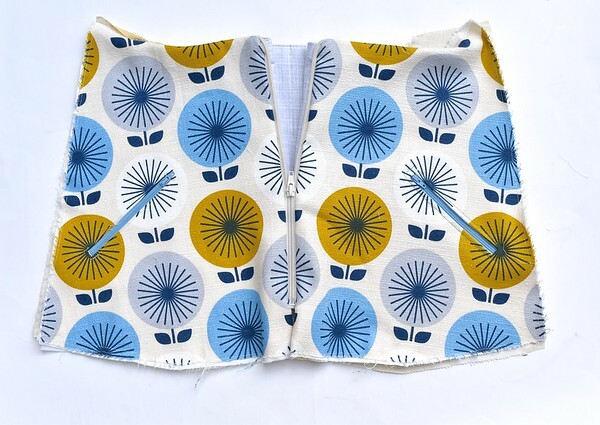 Turn the corner at X.
the zipper coils now peek out between the outer piece and pleat panel. The lining layer does not touch the zipper coils at all. the top edge of the side body is partly open toward the side seams. 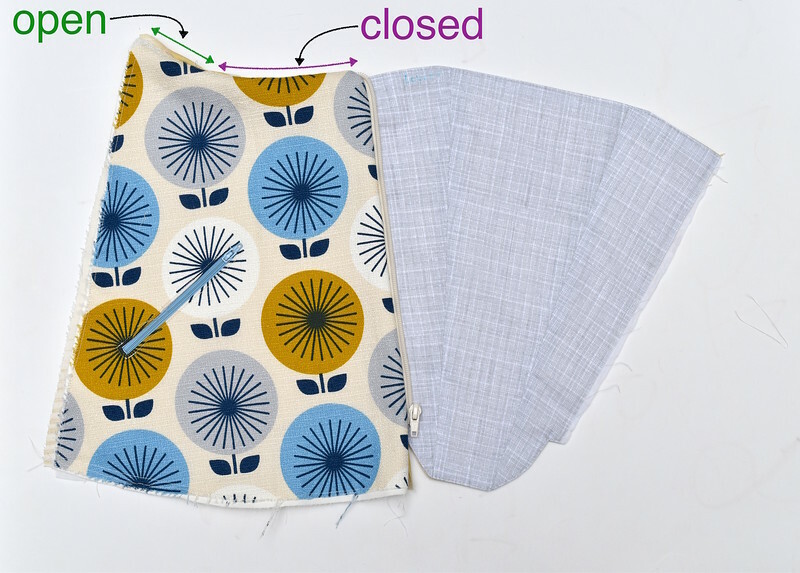 This is to allow the lining and outer layers of this side body to peel back from each other and be separately connected to the back pieces of the bag. Here is the lining side. As mentioned, the zipper coils are not visible here. 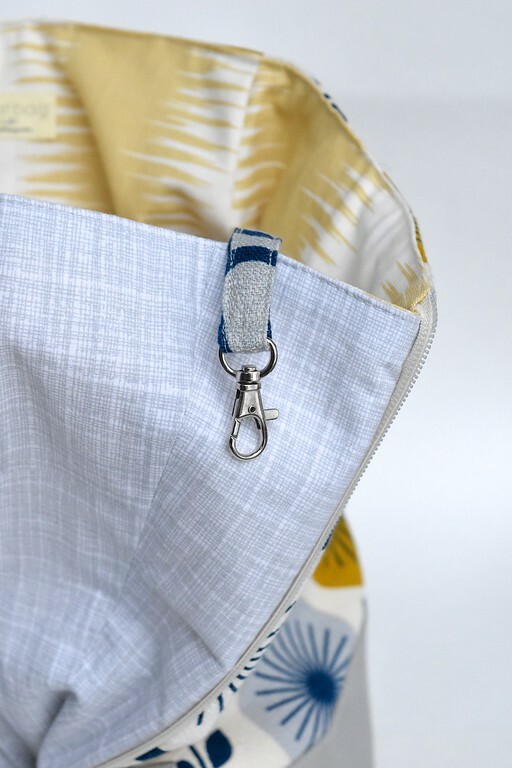 The pleated panel folds thus to position the zipper coils to meet with those on the other half of the zipper tape along the midline of the bag. 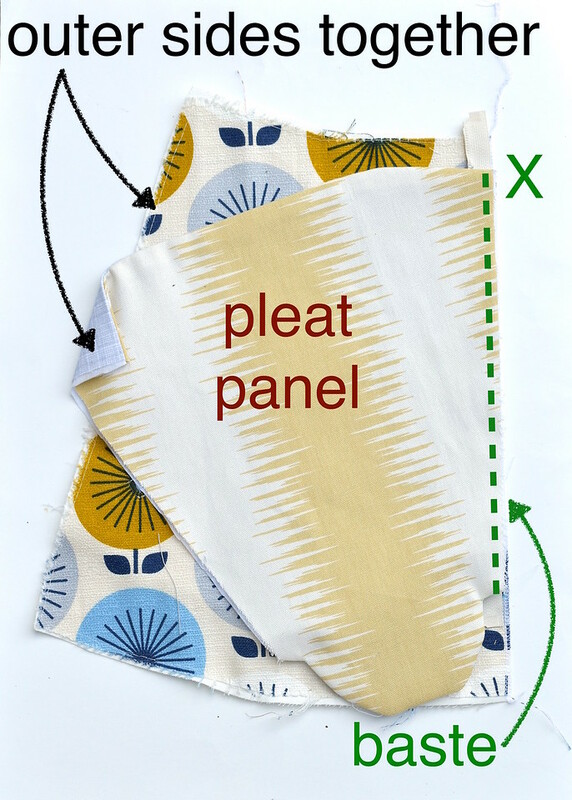 Attach the other edge of the pleat panel to the second side body of the bag. Again, the top edge is left partially open. Close the zipper and watch how the body pieces come together. Here is the top view of the pleat when folded shut. And this is the lining side. You can see that access welt, not-yet-connected to the outer layers! Now we'll finish up with the front zipper. 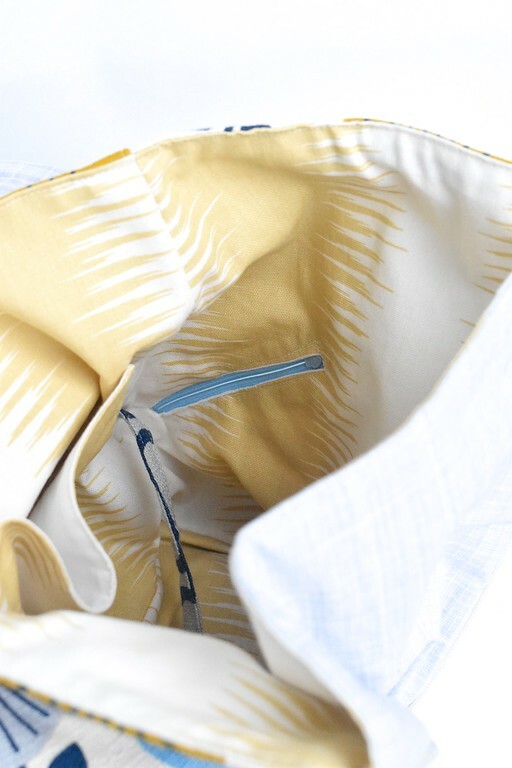 At the bottom edge of the bag, the pleated panel ends in a sticky-out tongue-shaped bit. 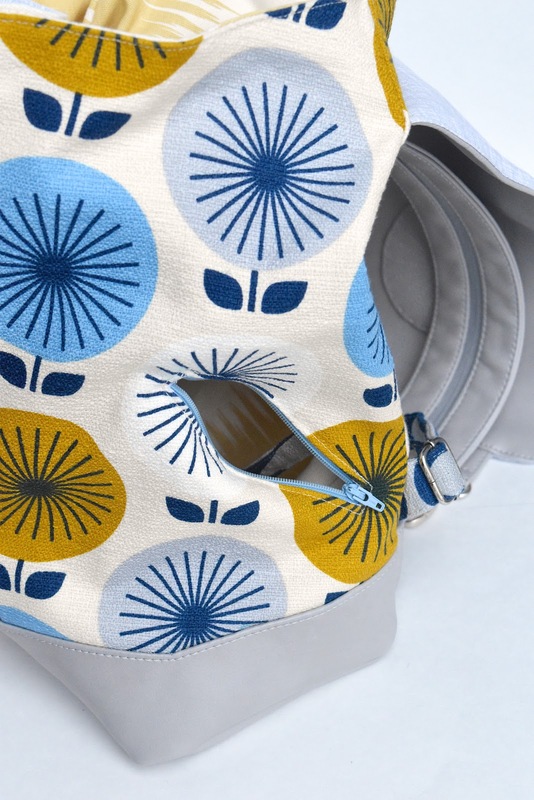 There is no reason for this other than to avoid leaving a gaping hole on the lining side of the bag through which we can see all the ugly seams of the outer fabric layers. We're going to secure that tail end of the zipper now, to enclose the retaining box and prevent the zipper from accidentally separating during use. 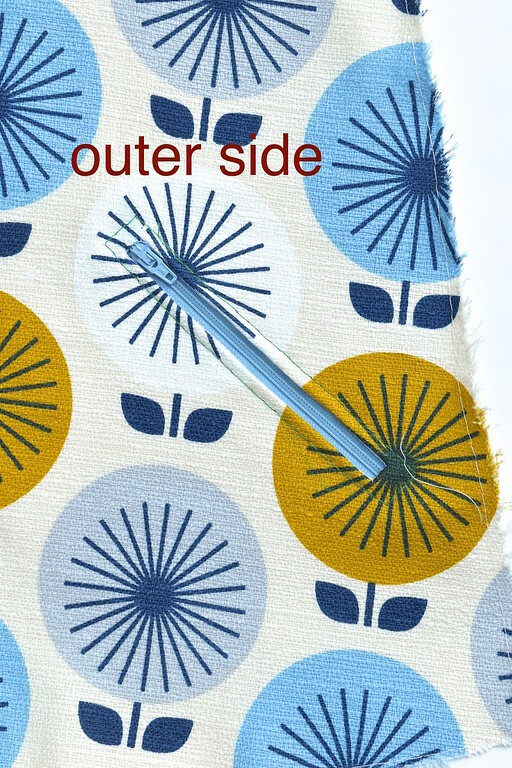 Cut a small rectangle of lining fabric a little wider than the zipper tape. Fold down the top edge of the rectangle (this will be the SA). We're going to insert that rectangle between the lining and outer layers, covering the tail end of the zipper. 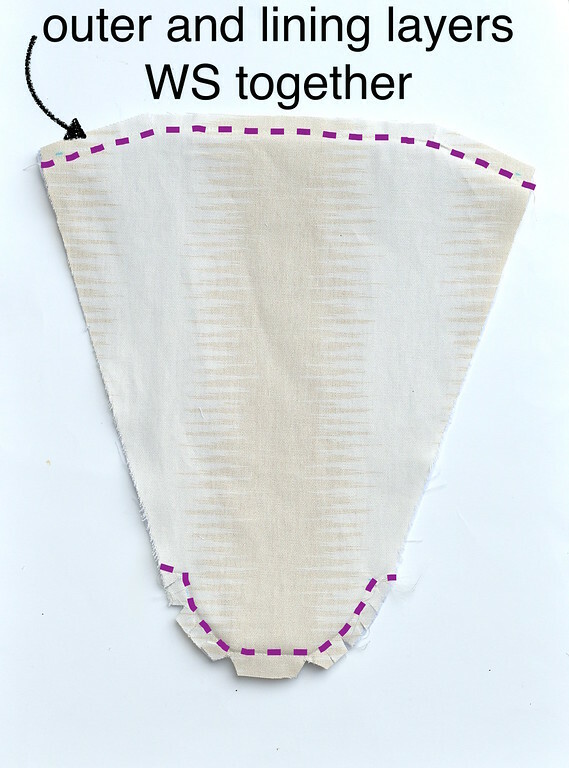 Fold back all the layers and slide the rectangle as high as the stitching lines allow. Fold just the lining layers back over the rectangle. 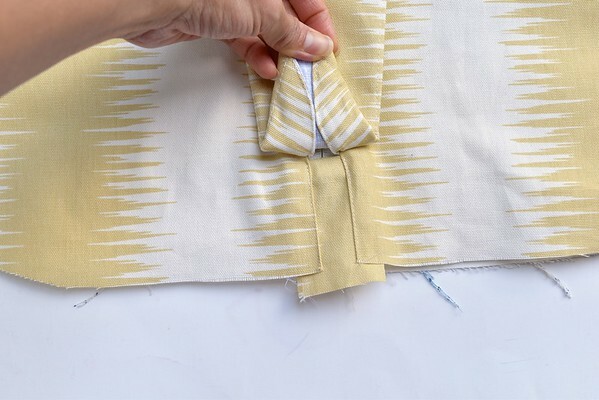 You'll want to keep the outer fabric layers underneath folded out of the way so you don't stitch over them in the next step. Stitch along both edges as shown to hold the rectangle in place. If you can stitch along the top edge of the rectangle as well, through the zipper coils, go for it. I was too lazy to switch to a zipper foot to do it, so I left it as is. Now flip everything over to the RS and face the bottom edge of the main bag body. 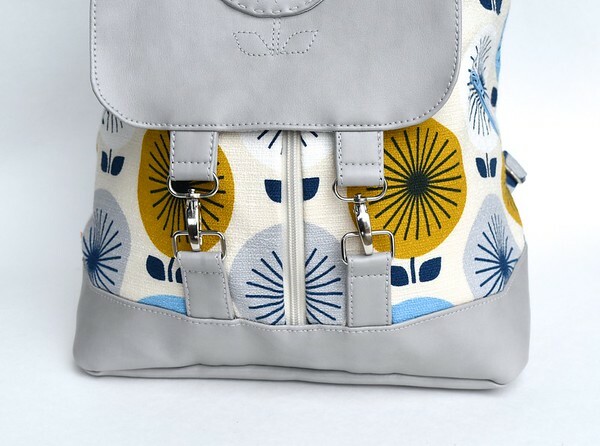 I used a vinyl border and inserted strap anchors for the front flap of the bag. 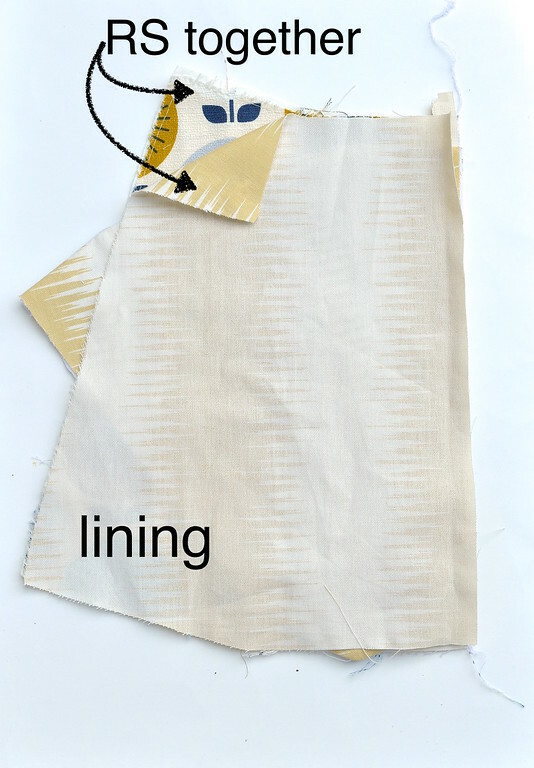 Remember to move the lining layer out of the way underneath so that you are stitching the vinyl border to only the outer fabric layer. Finally, we can connect the front/side of the bag body to the back piece which had the strap anchors and flap. 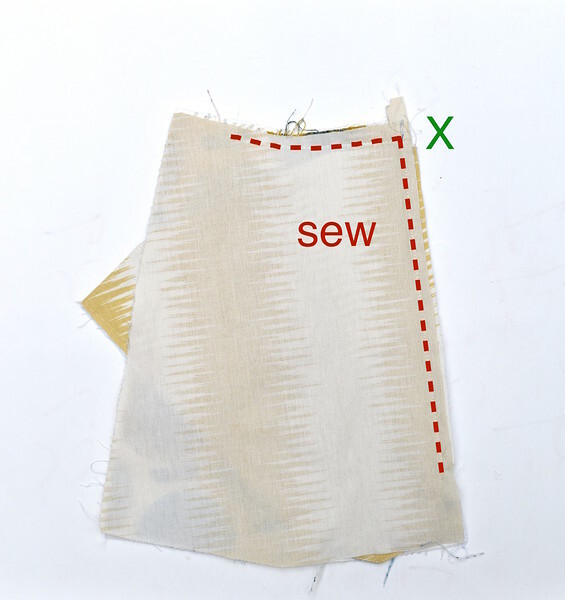 Sew the corresponding side seams of together, working with the lining and outer fabric layers separately. 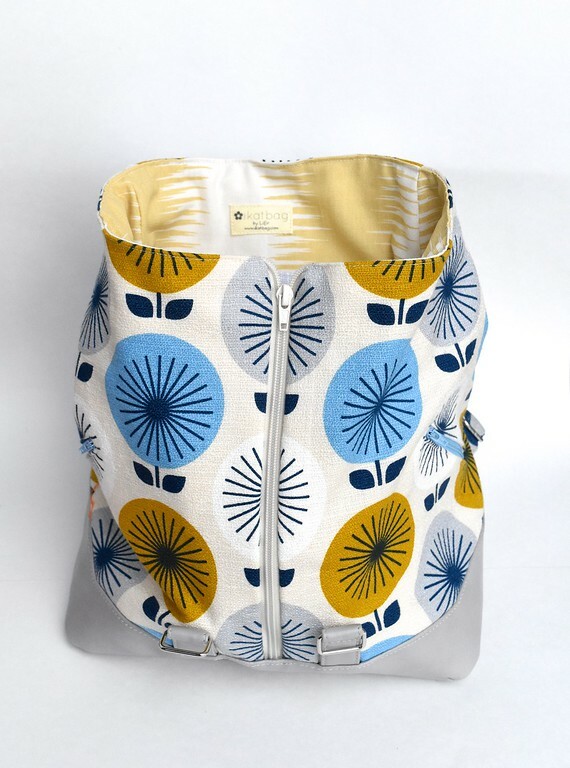 The outcome will be two cylinders (outer and lining), connected only at the front zipper and partway around the top edge. add the base pieces, again working with the lining and outer layers separately. turn the entire bag RS out - it will look practically finished. finally stitch around the access zippered welt, through all the layers. 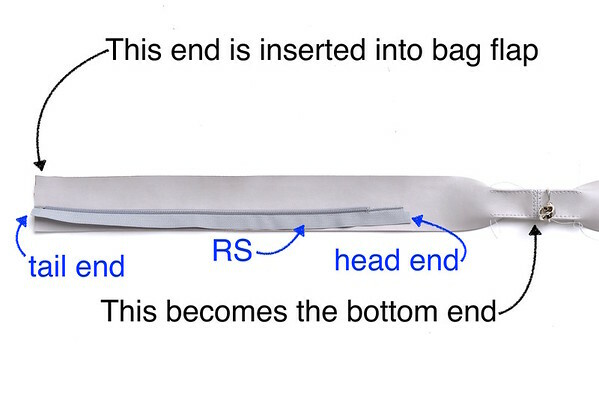 finish the top edge of the bag - fold the SA to the WS, tuck them between the layers, and topstitch all around. And yet, believe it or not, the next two bags might be even worse. Much of the fiddly construction sequence can be blamed on this being a no-SA-on-the-WS kind of bag. 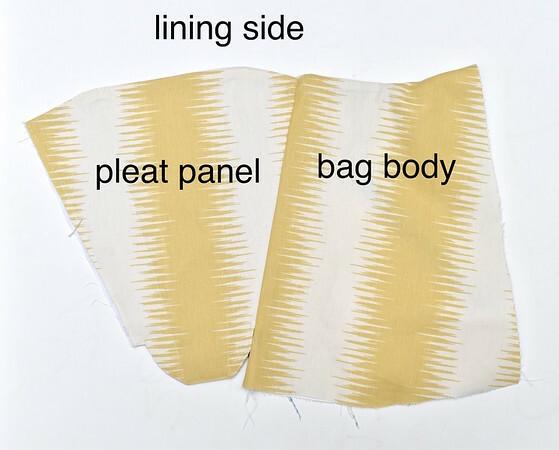 If you were making it bound-seam style a la commercial bags, the process can be significantly simplified. I figured I'd show you the more elegant way to construct a bag and then we can choose to cut all the corners we want to make it go faster. 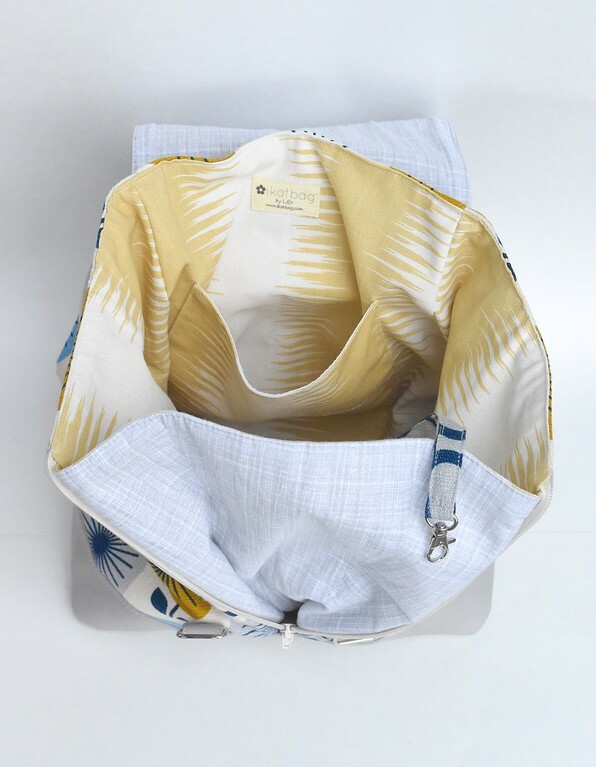 Also, I hope that deconstructing the techniques for you will help you visualize how they work, so you can pick features you like to incorporate into the bags you're making. This is beee-youtiful!! Thanks for having so much detail. I TOTALLY remember this series - I bookmarked every single one of them and then gathered them into their own bookmarked file. SO excited to see another one!! Your tutorials are superb!! I'm reading this and I'm like I want no need this bag. However I'm unable to even get a stitch in a straight line on the sewing machine. I'll bookmark it and hopefully one day I'll be able to make it or have someone make it for me. Going to look for your starters tutorials. 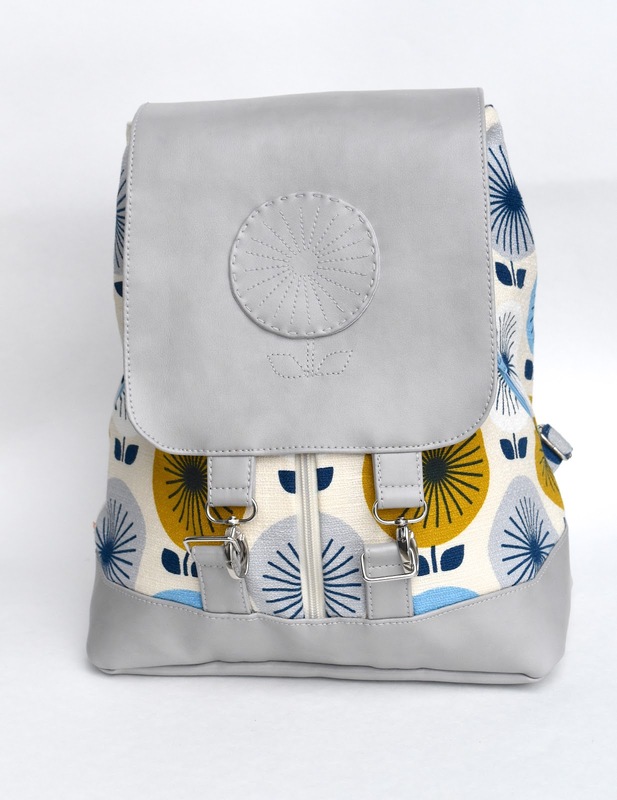 Wonderful bag! Few have such a unique ability to simplify the complicated. 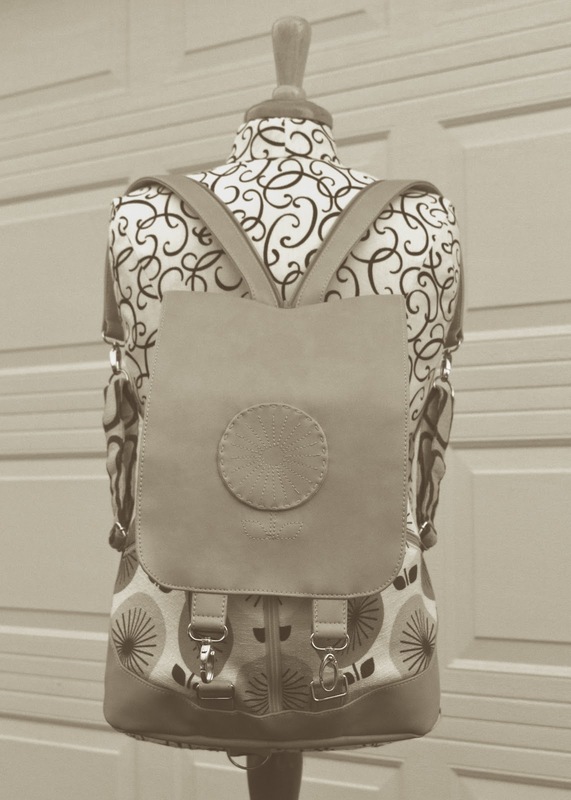 The details really make this bag. Beautiful. Thanks God Lier for you ! 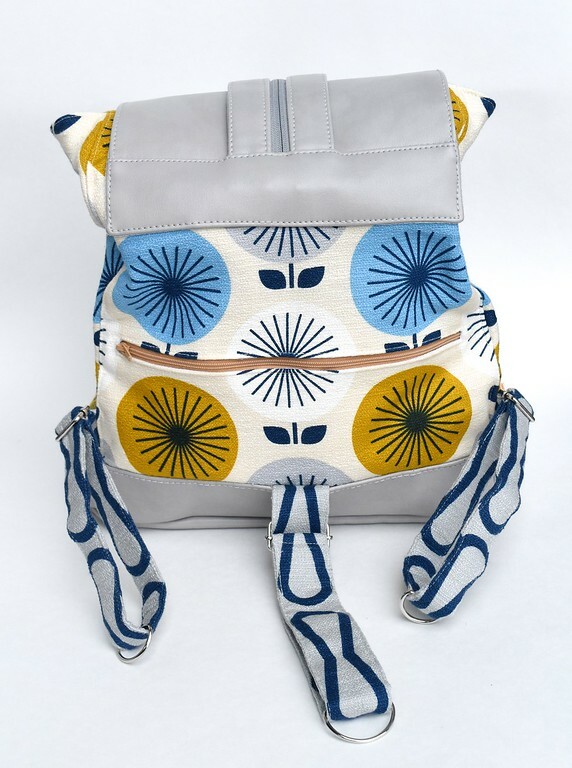 I love this bag, and the best part is that you have placed the outside pockets so strategically that it becomes theft proof also, when you have worn the backpack and you are in a crowd. I was looking for something like this for a long time. plus this one has lots more bonuses. An interesting post, with some really great techniques. I especially like the separating zipper strap. I am curious why you leave the bottom of the zippered expansion panel loose in the bag. I figured it was going to stay loose, after you sewed it up in the first step, but I'm not sure why you don't secure it into the lining. 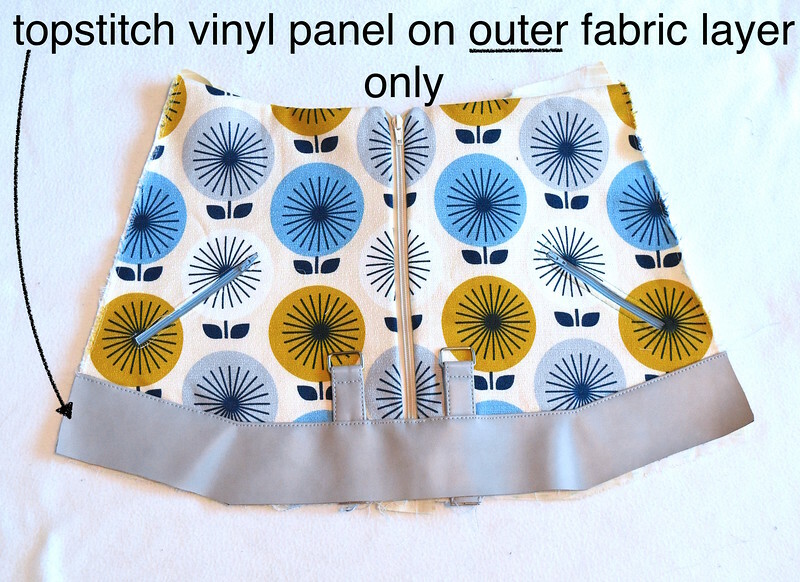 Does it affect the way the panel expands if you secure it into the lining? Katie: re: loose bottom - no reason other than it sits well when not secured to something at the bottom that might pull differently when open than closed. Also didn't want the stitches to show on the outside of the bag if I'd sewed through from the lining side.